A problem I have occasionally noticed when doing ultraviolet photography is a light leak. The leak is between the 52-48mm adapter ring I use to mount my Baader U Venus filter and the filter. I haven't seen the leak in my actual photos (which are usually using flash). But it does sometimes pop up in the liveview and I've also seen it when trying some UV video. To this end, I thought it might be helpful to have a lens hood that enclosed the filter and adapter. In theory this should prevent the light leak as light would no longer be hitting the edge of where the step-down ring meets the filter, since it would be shielded by the hood. To avoid just moving the light leak problem to another gap between stepping rings, I wanted to use the minimum of stepping rings. So I decided to create an adapter that would need to mount straight to the enlarging lenses I use for UV photography, which have a 40.5mm front thread. I already have a 77mm screw thread rubber lens hood, so that seemed a good choice for the hood. I have standardised on a 52mm thread for my Vis-UV-IR photography, so I knew that the adapter ring would also need a 52mm female thread. To create the adapter, I purchased a Cokin A 40.5mm adapter ring. This screws into the lens. 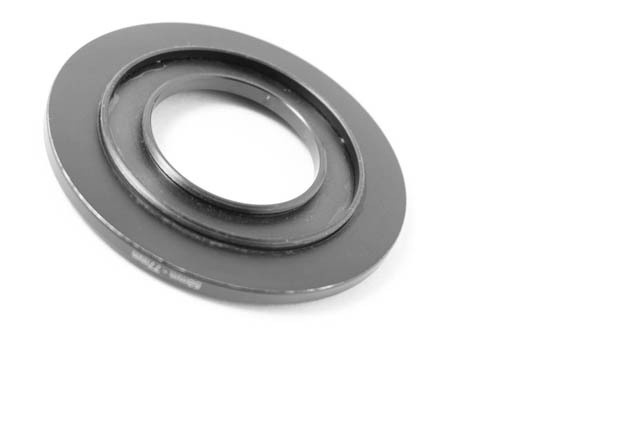 I glued this adapter ring into a 58-77mm step up ring, to effectively create a 40.5-77mm step up ring. As far as I'm aware you can't buy a stepping ring like that, which is why I had to DIY it. 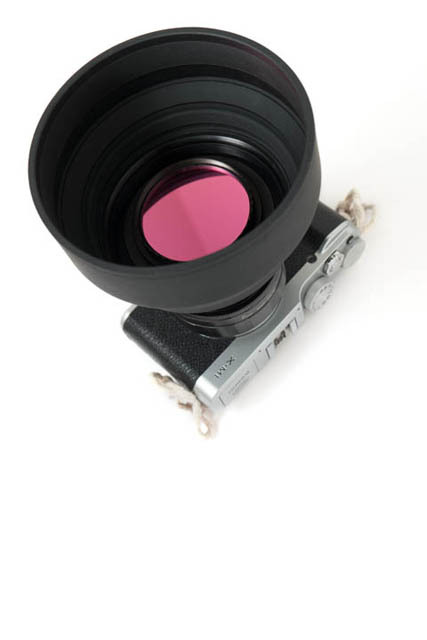 This does leave male 58mm threads on the rear of the adapter, but they are not a problem with small enlarging lenses. They could be filed off if they were. To allow attaching 52mm size filters to this ring, I took a 62-52mm step down ring and filed off the 62mm male threads on the back. This left a large flat surface, which I then glued onto the 40.5mm Cokin A adapter. 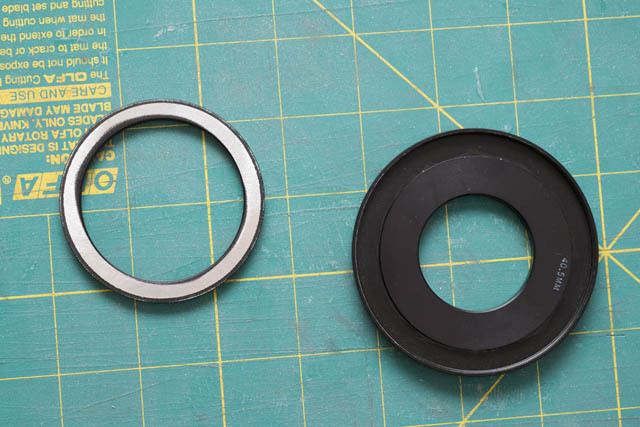 So the 40.5mm Cokin A adapter has the 58-77mm step up ring glued on the back, and a 62-52mm step down ring (with the 62mm thread filed off) glued on the front. 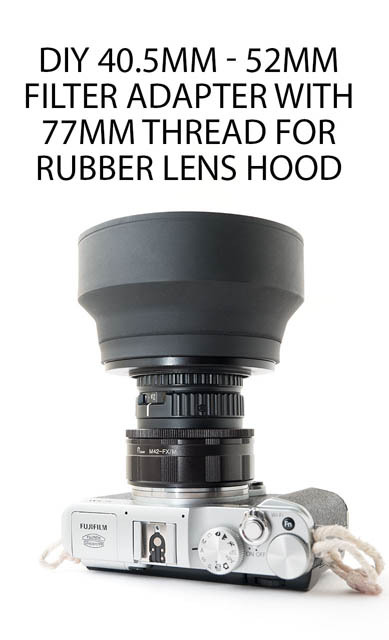 I can now attach my rubber lens hood to the outer 77mm thread. 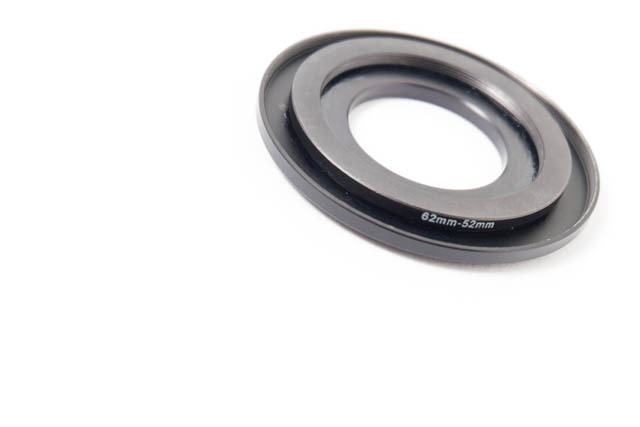 And my filters (via stepping rings) can be attached to the inner 52mm thread. I tried to test my new setup to see how well it resolved the light leak problem. However, I couldn't even recreate the light leak without the lens hood - it seems the problem mysteriously resolved itself. Never mind, it is still useful to be able to have a large lens hood that filters can be mounted in. I bought a 40.5 – 77 adapter on EBay last November 2016. Took about a month to locate with great effort. Yep, I have seen some there since I created my own one. They’re quite expensive compared to the vast majority of stepping rings, but they probably work out cheaper than a DIY version when factoring in the cost of your time.